The Government of British Columbia, Ministry of Transportation, Environmental Management Section has a mandate to develop and maintain policies, standards, specifications and procedures on highway related environmental matters. The BC Ministry of Transportation (BC MoT) website has information on exclusion fencing, wildlife reflectors, and wildlife warning signs. The BC MoT administers the Wildlife Accident Reporting System (WARS). The WARS system is designed to analyze wildlife accident data collected by BC Highways Maintenance Contractors on numbered highways in British Columbia. It is a valuable information resource. The latest WARS report WARS 1988-2007, Wildlife Accident Monitoring and Mitigation in British Columbia, Special Annual Report is available on the BC MoT website. In 2003, the Government of British Columbia, Ministry of Water, Land and Air Protection developed a Wildlife-Human Conflict Prevention Strategy which identified wildlife vehicle collisions as an area of conflict. The Government of Alberta, Ministry of Transportation posts annual collision statistics on their website. The Ontario Road Ecology Group (OREG) is a not-for-profit conservation program dedicated to protecting wildlife, particularly Species at Risk from the threats of roads; primarily habitat loss & fragmentation and direct mortality caused by wildlife/vehicle collisions. OREG works with government and non-government transportation planners, scientists, educators and organizations to protect biodiversity from the threats of roads through data collection, policy and public engagement. 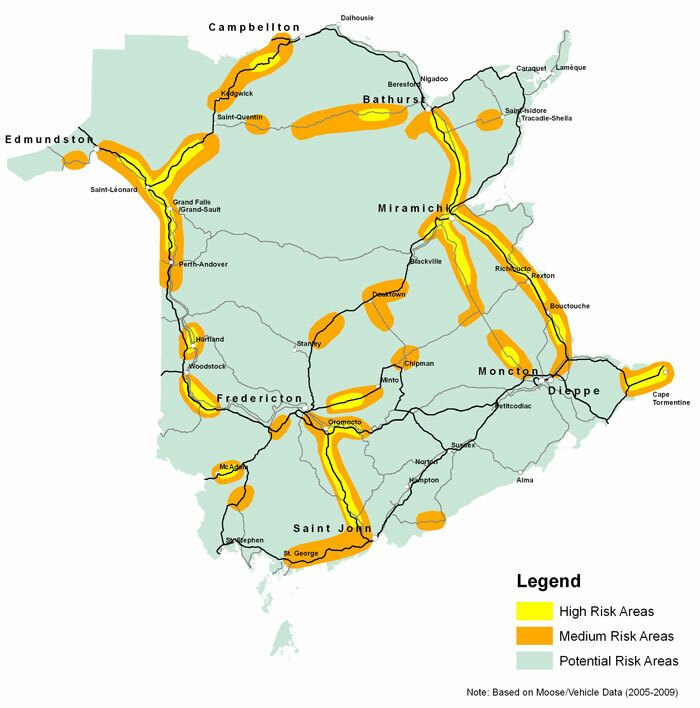 OREG has published A Guide to Road Ecology in Ontario. OREG has also sponsored conferences in 2007, 2008, and 2011 to discuss road ecology issues. Discuss tools for planning and designing more ecologically sustainable roads. The forum consisted of a series of moderated presentations followed by open discussions about designing and planning locations of road networks, and developing a framework for ecologically sound, feasible, and cost-effective designs for ecopassages. Forum presentations focussed on mitigating road effects on species-at-risk populations in southern Ontario. 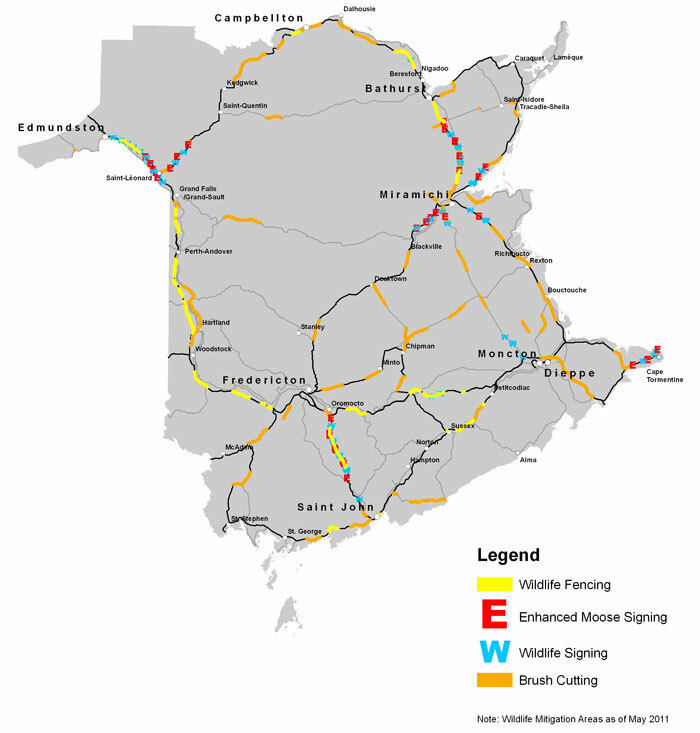 The Department of Transportation in the Province of New Brunswick has a Think Moose webpage. Slow Down and Save a Buck! In response to high and rising traffic volumes, sections of the Trans-Canada Highway have been upgraded from a two-lane to a four-lane divided highway in Banff National Park. Twinning the Trans Canada highway has been undertaken in phases as funding allowed since 1981. The final phase of twinning is currently within budget and on-schedule to be in service by 2013. Fencing has been installed on both sides of the twinned highway sections to prevent large animals from getting onto the highway. Vehicle-wildlife collisions have been significantly reduced. Wildlife underpasses and overpasses have been installed to connect vital habitats and help sustain biodiversity. Parks Canada has researched and implemented many wildlife mitigation methods in the Mountain Parks along the Trans-Canada highway. Highway Wilding is a 5 year wildlife monitoring and research collaborative project, building on the leadership of Parks Canada, in road ecology and landscape scale connectivity in the Canadian Rocky Mountains. This website is a good source for information on the effects of highways on wildlife populations and the effectiveness of Parks Canada's highway mitigation measures on the Trans-Canada Highway in Banff National Park. It contains information for transportation planners, wildlife researchers, decision-makers and the general public.Other partners are The Miistakis Institute, the Western Transportation Institute, the Wilburforce Foundation and the Woodcock Foundation. Highway Wilding provides solutions that help reduce conflicts between transportation corridors, wildlife conservation, and large-scale landscape connectivity. Our goal is to gather the essential scientific information and to develop the appropriate tools to address current and future ecosystem management priorities as they relate to maintaining landscape-scale connectivity across transportation corridors and changing climates. The Transportation Association of Canada (TAC) is a national association with a mission to promote the provision of safe, efficient, effective and environmentally and financially sustainable transportation services in support of Canada's social and economic goals. In Canada as a whole, TAC has a primary focus on roadways and their strategic linkages and inter-relationships with other components of the transportation system. TAC hosts an annual conference on transportation issues. A conference is held is held annually. Conference proceedings are available. Wildlife Collision Prevention Program researchers attended the TAC Annual Conference and Exhibition, held in St. John's Newfoundland, September 21-24, 2003. The theme of this conference was "The Transportation Factor" and the conference was designed to focus attention on may road and transportation topics as well as the importance of transport sector in our daily lives. To familiarize participants with the scope of the wildlife vehicle accident problem. To review and assess current accident mitigation techniques. To develop directions for future research. The North Carolina State University based Institute for Transportation Research and Education (ITRE) conducts research, education, and technical assistance projects on a wide variety of surface transportation issues. ITRE provides quality end products and technical support that improve the transportation systems of the region and nation. The University of California at Davis Road Ecology Center brings together researchers and policy makers from ecology and transportation to design sustainable transportation systems based on an understanding of the impact of roads on natural landscapes and human communities. The Road Ecology Center and the Information Center for the Environment collaboratively developed and distributed the California Roadkill Observation System (CROS). The goal of the CROS is to encourage participation of large numbers of people in both understanding the extent of roadkill and helping develop innovative ideas for reducing roadkill. IN a one year period, >200 people reported over 6,000 roadkill observations across the majority of the state using the website. The federally funded Center for Transportation and the Environment (CTE) conducts research, education, and technology transfer that seek to mitigate the impacts of surface transportation on the environment. CTE is a national university transportation center, funded in part by the U.S. Department of Transportation and the North Carolina Department of Transportation. CTE is located in the offices of the Institute for Transportation Research and Education (ITRE) on North Carolina State University's Centennial Campus. The Deer-Vehicle Crash Information Clearinghouse (DVCIC) is a project funded by the Wisconsin Department of Transportation that cooperatively involves committee members from the natural resources and transportation departments of Illinois, Iowa, Michigan, Minnesota, and Wisconsin. DVCIC is located at the University of Wisconsin - Madison. The U.S. Department of Transportation, Federal Highway Administration website, Critter Crossings, describes the impact of transportation on wildlife and highlights exemplary projects and processes that are helping to reduce these impacts. In 2008, a US national study was conducted on the causes and impacts of wildlife vehicle collisions.This study provides recommendations and solutions for reducing these collisions. Wildlife-Vehicle Collision Reduction Study: Report to Congress. 2008. M.P. Huijser, P. McGowen, J. Fuller, A. Kociolek, A.P. Clevenger, D. Smith, and R. Ament. Report No. FHWA-HRT-08-034. Prepared for the Federal Highway Administration, McLean, VA. 251 pp. A best practices manual was developed as a part of the national study and is meant to accompany the above FHWA training course. Wildlife-Vehicle Collision Reduction Study: Best Practices Manual. 2008. M.P. Huijser, P. McGowen, A.P. Clevenger, and R. Ament. Prepared for the Federal Highway Administration, McLean, VA. 174 pp. The U.S. Department of Transportation, Federal Highway Administration website Keeping It Simple - Easy Ways to Help Wildlife Along Roads provides examples of how transportation agencies are reducing highways' impact on wildlife and fish in the United States. The U.S. Department of Agriculture, Forest Service website Wildlife Crossings Toolkit is a searchable database of case histories of mitigation measures, and articles on decreasing wildlife mortality and increasing animals' ability to cross highways. The Toolkit project was initiated by the USDA Forest Service, San Dimas Technology and Development Center. Other partners include the Federal Highway Administration and Western Transportation Institute. The U.S. Forest Service, Pacific Southwest Research Station and the Missoula Technology and Development Center have produced an award-winning video Avoiding Wildlife-Vehicle Collisions. The video focuses on identifying the risk factors for wildlife vehicle collisions. Shot on location in Montana and Georgia, the video highlights microsites along highways where animals are more likely to be found attempting to cross the road. The discussions of how deer sense the world are particularly interesting. The more people know about how deer are likely to react to vehicles, the more control they have over the risk variables involved in collisions. The Great Northern Landscape Conservation Cooperative is a multi-agency partnership working across boundaries and jurisdictions to establish a regional response to landscape conservation. They offer an extensive list of webinars on various topics. Of particular interest is Wildlife Issues in Transportation Planning. Tony Clevenger, Marcel Huijser, and Rob Ament, all from Montana State University's Western Transportation Institute, are the featured speakers. The discussions cover planning, designing, and monitoring wildlife crossings, habitat connectivity, and cost benefit analyses of wildlife collision mitigation. The mission of the Western Transportation Institute is to advance rural transportion through research and education. WTI is located at Montana State University - Bozeman. The Road Ecology Program seeks to provide national leadership in understanding the interaction between roads, natural resources, and the environment. The Michigan Deer-Crash Coalition has published a "Don't Veer For Deer" brochure and their website has useful driving tips and public safety announcements. The Ecostudies Institute is a nonprofit organization committed to ecological research and conservation, which carries out programs of rigorous scientific research, on-the-ground management, and education and outreach. Ecostudies Institute is currently working with the Oregon Department of Transportation on a project that builds on an earlier study of hot pots for animal/vehicle collisions (Wildlife Hot Spots Along Highways in Northwestern Oregon). Defenders of Wildlife has a Watch Out For Wildlife page created to educate people about the importance of driving smarter and safer in wildlife areas. Their handbook, Getting Up To Speed: A Conservationist’s Guide to Wildlife and Highways, is written for conservationists to provide the necessary foundation to become better informed, more effective stakeholders in transportation debates. You can download and print out this card to keep in your car in case of a wildlife collision emergency. Conducted every two years, the International Conference on Ecology and Transportation (ICOET) is designed to address the broad range of ecological issues related to surface transportation development, providing the most current research information and best practices in the areas of wildlife, fisheries, wetlands, water quality, overall ecosystems management, and related policy issues. ICOET is a multi-disciplinary, inter-agency supported event, administered by the Center for Transportation and the Environment. This international conference brings together key organizers and researchers who are working to reduce the ecological impacts of transportation. The Berryman Institute is a national organization based in the Department of Wildland Resources at Utah State University and the Department of Wildlife & Fisheries at Mississippi State University. The Berryman Institute is dedicated to improving human-wildlife relationships and resolving human-wildlife conflicts through teaching, research, and extension. The Berryman Institute publishes the Human-Wildlife Interactions journal, and Volume 2, Issue 1, Spring 2008 was dedicated to wildlife vehicle collisions. The benefits of using a Planning and Environment Linkages approach. Some first steps for getting started, including a list of activities to help you begin. Additional resources that are related to planning and environment linkages. The Arizona Wildlife Linkages Workgroup is a collaborative effort between nine public agencies and nonprofit organizations. The partners began collaborating on the "Missing Linkages" workshop in April 2004. Biologists, engineers, planners and land managers have worked together since then to identify large blocks of protected habitat, the potential wildlife movement corridors through and between them, the factors that could possibly disrupt these linkage zones, and opportunities for conservation. The information on Arizona's Department of Transportation Wildlife Linkages webpage can help state/federal agencies, county planners, land conservancies, tribes, private landowners and other organizations work together with a comprehensive, landscape-scale approach toward conservation and highway safety goals, while accomodating the growth of Arizona's population, an expanding economy, and associated infrastructure. The Arizona Wildlife Linkages Assessment documents and map are available for download from this page. Kennedy Space Centre has a roadkill prevention program called the Avian Abatement Team (commonly known as the Roadkill Posse). Kennedy Space Centre is adjacent to a National Wildilfe Refuge, where frequent animal mortality due to wildlife vehicle collisions ocurrs. This roadkill attracts black vultures, which can jeopardize the safety of the Space Shuttle operations. Infra Eco Network Europe (IENE), established in 1996, is a network of experts working with various aspects of transportation, infrastructure and ecology. It was initiated in 1996 and is currently hosted by the Swedish Biodiversity Centre (www.cbm.slu.se). IENE arranges international conferences on ecology and transportation. The conferences provide a recurring interdisciplinary forum for the exchange of new scientific findings and practical experiences between the sectors of environment and transport. IENE international conferences aim at presenting cutting-edge research, identifying urgent questions and problems, discussing effective solutions, and outlining paths for upcoming activities in transport and infrastructure ecology. IENE hosted the 2012 International Conference and practical field excursions on ecology and transportation, on 21-24 October 2012 in Potsdam-Berlin, Germany. It was organised in cooperation between the Infra Eco Network Europe (IENE), the German Federal Government and the Swedish Transport Administration. A Wildlife Collision Prevention Program partner, Sylvan Consulting Ltd, presented a research paper on the Wildlife Protection System and a poster [PDF - 676kb] on Collision Risk Behaviour in Deer at the Infra Eco Network Europe Conference 2003 in Belgium in November 2003. Deer Collisions UK, is part of The Deer Initiative, which is a broad partnership of statutory, voluntary and private interests dedicated to "ensuring the delivery of a sustainable, well-managed wild deer population in England and Wales." The Endangered Wildlife Trust is a registered, non profit organization from South Africa, that administers the Wildlife & Transport Programme (WTP). This broadly-focussed programme addresses biodiversity conservation across all transport industries (road, rail, air, and marine). WTP maintains an active blog site.